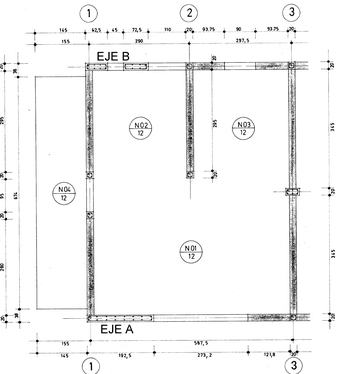 The Direction attribute is intended to identify two principal horizontal directions of the building plan. It is possible to specify different Lateral Load-Resisting System (LLRS) and the corresponding Material of the Lateral Load-Resisting System in two directions called Direction X and Direction Y; these systems are often referred to as Hybrid Systems or Mixed Systems. Where it is possible to specify directions, Direction X is parallel to street, and Direction Y is perpendicular (orthogonal) to street. In some cases, it is not possible to identify Direction X and Direction Y - thus the user can select Unspecified Direction. Note that other types of hybrid systems can be described by the Hybrid Lateral Load-Resisting System attribute, which should be applied in one of the following cases: a) there is more than one LLRS in the building, but there is no clear distinction between LLRSs in directions X and Y, or b) there is only one LLRS, but two or more materials of the LLRS are used in different portions of the building. 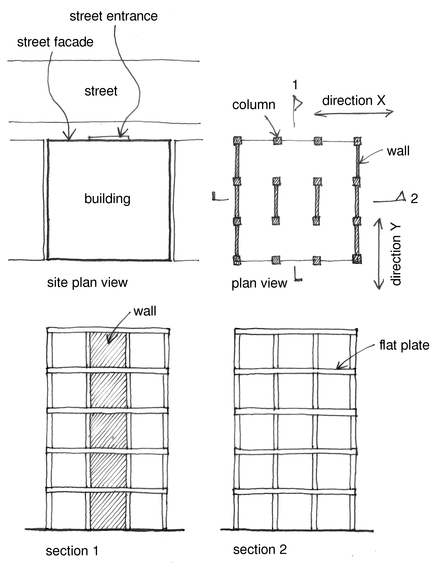 EXAMPLE 1: A building has two different LLRSs: reinforced concrete flat plate (slab and column system) parallel to street, and reinforced concrete wall system perpendicular to street, as shown below. In this case, Direction X (parallel to street) is associated with a flat plate system (LFLS) (see Section 2), and Direction Y (perpendicular to street) is associated with a wall system (LWAL) (see Section 1). EXAMPLE 2: The Direction attribute can be used to describe a hybrid LLRS from Chile, with reinforced concrete frames in longitudinal direction (Direction X) and confined masonry in transverse direction (Direction Y). It is assumed that Direction X (parellel to street) is longitudinal direction because entrance to individual housing units is in that direction (M. O. Moroni Yadlin). 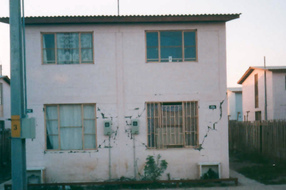 EXAMPLE 3: The Direction attribute can be used to describe a hybrid system from Chile, where confined masonry is used in one direction and reinforced concrete shear walls in other direction (Moroni, Gomez, and Astroza, Chile, World Housing Encyclopedia Report 8). The photo shows an earthquake-damaged building, and the drawing shows a typical building plan (not related to the building shown on the photo).